Even during the WWII soldiers treated the enemy. 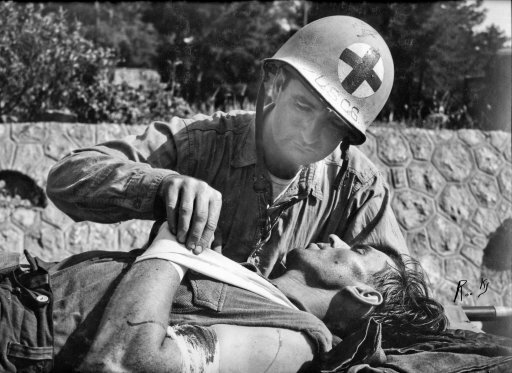 US soldier treating a captured German soldier. 1944. Two ICRC initiatives to reaffirm the relevance of international humanitarian law (IHL) in today’s armed conflicts When discussing international humanitarian law (IHL) with people—whether armed actors, political actors or otherwise—one is often confronted with scepticism on the significance of the law today: ‘Nobody respects it anyway.’ ‘The other side does not respect it, so why should we?’ ‘They are terrorists, so the law does not apply to them.’ ‘Wars today are different. The old rules are no longer relevant’. Coupled with daily reports of atrocities in conflict zones, this negative discourse can lead to despair and a tendency to question the impact and relevance of IHL in modern warfare. The perception that IHL is always violated and therefore useless is not only wrong, it is also dangerous. Yes, violations do occur. However, such a negative and dismissive discourse renders violations banal and risks creating an environment where they may become more acceptable. What if we were to give concrete examples of compliance with IHL? What if we were to provide evidence that shows how respect for the law can actually lead to a more protective environment in wartime? What if we changed our approach to IHL? In an effort to do so, the International Committee of the Red Cross (ICRC) is currently undertaking two initiatives with a view to reaffirming the relevance of IHL in contemporary armed conflicts. The first one is the recently launched IHL in Action database. This platform showcases real examples of compliance. The second initiative aims to reflect upon the benefits of respecting IHL and the costs of violating IHL, in the short, medium and long term. It is worth emphasizing that neither project is intended to minimize the many violations that continue to occur. Rather, they are an invitation to change the narrative on IHL, and to join the larger reflection on the importance of complying with that yet imperfect but fundamentally relevant body of law in order to minimize human suffering in armed conflicts. Over the past decades, IHL has been developing exponentially—new treaties have been adopted, a wealth of international and domestic jurisprudence has been created, many armed forces train their troops in IHL, etc. Along with this expanding framework is a general public that is increasingly informed about armed conflicts around the world. These developments are a remarkable achievement that reflect a growing awareness of and interest in international humanitarian law. Despite this visible progress, the line between the inherently tragic consequences of war and violations of the laws of war is often blurred. War, by its very nature, is a devastating occurrence. Yet, IHL is not about ending wars. That is the role of another body of law, encapsulated in the United Nations Charter and enforced by the international community. Rather, the main objective of IHL is to place limits on conduct during war and to alleviate the devastating consequences of conflict to the extent possible. It therefore also has a different underlying purpose than international human rights law. The specificity and nuances of IHL can, however, be difficult to explain, especially to those less familiar with this body of law or the history of its creation. For example, how can the loss of human lives be part of ‘legally acceptable’ collateral damage, when killing is not acceptable human behaviour? The accounts of violations, which are ever-present in the media and in reports by international and non-governmental organizations, draw attention to a long list of abuses. This focus on the negative may stem in part from a general feeling of frustration in the inability of the international mechanisms to bring peace to existing conflicts, rather than actually being a reflection on the adequacy of IHL itself. Regardless, for those raising concerns about the relevance of IHL, this list of violations reinforces their pre-existing beliefs and acts as a confirmation bias. For others, who have high expectations of what IHL can achieve, the discourse is appallingly discouraging. Both—for different reasons—view IHL in a negative light. Thus, as Marco Sassóli and Yvette Issar have pointed out, there is a ‘credibility gap’ between the laudable developments of the law, the promises it conveys and what it actually delivers on the ground. Such negative perceptions of IHL could have tragic consequences. If there is a general sense that everyone violates IHL, we run a serious risk that such behaviour could be normalized. Normalization of violations could have a terrible impact on those affected by armed conflicts. Why is it worth focusing on the positive? Recent psychological studies on how to best influence behaviour, such as Morsella et al.’s Handbook on Human Action, have demonstrated that focusing on unfavourable outcomes is not an effective way to change attitudes. To the contrary, pointing out desired behaviours is more likely to generate change. The ICRC believes that more a positive focus on IHL reporting can engender further compliance with the law. As the guardian of IHL, the ICRC has the privilege and ability to observe frequent, though often underreported, examples of respect for IHL by belligerents around the world. For instance, in Colombia, IHL has played a key role in mitigating the consequences of conflicts and ultimately in providing a common ground for the parties to enter into negotiations. This led to the recent adoption of a cease-fire agreement. As mentioned by the Colombian Ambassador in Geneva this autumn: ‘IHL is a shared language between parties to a conflict and as such is an essential vehicle to open the channel that in the long-term gives the possibility to dialogue’. Compliance around certain treaties prohibiting or limiting the use of weapons, such as the Ottawa Convention, has proven exemplary. There has been, for example, a drastic reduction in the victims of anti-personnel mines, from 20,000 victims annually in the mid-90s to the low thousands today. ‘Success stories’ like these are lessons learned that can be shared to better operationalize the law. These are reasons why the ICRC is currently undertaking its initiatives to collect and promote evidence-based arguments to reaffirm and strengthen the positive impact of IHL in today’s armed conflicts. IHL in Action is a collection of case studies showcasing real situations in which the law has been respected. It is compiled with publically available information by the ICRC and its four academic partners (Emory University School of Law, Leiden University, Interdisciplinary Center Herzliya and Roma Tre University). Recently launched, the project is ongoing and welcomes new contributions that will enrich the platform. The goal is to provide concrete examples of respect for IHL, which can be used for teaching, in negotiations, in official statements and at a policy level. Each case study can be searched by country (on a clickable map) or by topic (conduct of hostilities; protection of persons and objects; combatants and POWs; implementation mechanisms). The cases include a summary of the specific situation, a selection of open-source official documents on IHL, and a discussion section raising thought-provoking questions. It is important to note that while the case studies illustrate examples of respect for IHL, they must not be perceived as minimizing any violations that may have occurred in the conflicts discussed. Neither should they be perceived as legitimizing any belligerents. Moreover, several case studies demonstrate how behaviour in a particular conflict changed over time. For this reason, these cases contain references to alleged violations that precipitated the need for such change. Such cases are included in order to demonstrate that practice can evolve over time and that in a single conflict we might see both respect for IHL and violations of IHL. And, of course, this is not an exhaustive endeavour, many more examples are to be found. Why should parties to the conflict or other stakeholders respect IHL? In this second initiative, the ICRC aims to further support the law with practical arguments. We plan to engage in a broad reflection over what benefits stakeholders might accrue for respecting the law and what the consequences—or costs—of violations might be. In warfare, there are many hidden costs: human, social, financial, psychological, etc. To what extent may compliance with IHL mitigate, or even reduce, these costs, in the short, medium and long term? The ICRC’s project recognizes that in our contemporary landscape, such a cost/benefit analysis could be an effective prism through which to engage with parties to the conflict and other influencers. IHL and displacement. Does IHL, when respected, mitigate or foster displacement? IHL and peacebuilding. Does respect for IHL during a conflict strengthen foundations on which peace can be built? In addition to collecting empirical evidence, the ICRC’s Law & Policy Forum will also create a multidisciplinary network of scholars and practitioners concerned with the issues. Part of this effort will include launching a call for papers in early 2018 and gathering experts to discuss the topics. We invite you to visit our database and contribute to it by sharing examples of success stories at ihl_tools@icrc.org. Vincent Bernard is editor in chief of the International Review of the Red Cross. He is also the head of the Law and Policy Forum, which leads ICRC’s engagement with expert audiences interested in teaching, researching and debating international humanitarian law (IHL). The unit also runs the Humanitarium conference center in Geneva. Vincent Bernard worked for the ICRC in the field in Dakar, Nairobi and Jerusalem and has travelled extensively in most ICRC’s operations. Prior to joining the organization, he studied political science, law and international relations in Geneva, Strasbourg and London. Juliane Garcia Ravel is a Law & Policy Research Officer at the ICRC. She heads the project on IHL in Action and is in charge of law and policy research partnerships. As a lawyer in International Law, she has been working for the ICRC since 2010 in various positions, both at headquarters and in the field (Colombia). Juliane Garcia Ravel holds a Master degree in Public International Law from the University of Grenoble (France) and an LL.M in International Humanitarian Law from the Geneva Academy of International Humanitarian Law and Human Rights (Switzerland). So, to begin, focusing on the positive is indeed a necessary and progressive step in the right direction. Why it took you so long to take this initiative is a bit of a mystery, but that’s not the most important issue. You cannot, however, just shine a light on the examples of where IHL works, and ignore where it’s miserably failing, especially that in today’s conflicts, it’s largely just miserably failing, and you, as the “guardians of the Geneva Conventions”, are miserably failing at your job to ensure its respect. In doing so, you are actively engaging in perceptive bias, and leading people, especially the lay, that IHL – as it stands today in its current form – is working for everyone, and ignoring the fact that for the vast majority of victims of armed conflicts around the world, it is not working. This could all be misinterpreted of course, and indeed it can also be my own personal perception. Don’t get me wrong, I do strongly believe in IHL, and that the world would be a much worse place without it. However, askew initiatives like this only serve to warp people’s view, and in the process justify your inaction on the most important of topics: protecting victims of armed conflicts. Tell me how IHL is helping starving Yemeni children right now, or in South Sudan, or Iraq, Syria, Palestine, Myanmar. Knowing full well that it may not apply in its entirety in non-international armed conflicts. We completely agree that there are still too many circumstances where, unfortunately, IHL is violated . See for example our Online Casebook: https://casebook.icrc.org/. With “IHL in action” our purpose is not to paint a rosy picture of IHL application but to also show that there can be – and there are – instances of respect. See also a recent interview addressing some of your points: https://www.theworldweekly.com/index.php/reader/view/magazine/2018-01-04/how-effective-is-humanitarian-law-in-todays-conflicts/10436/.